One of India’s most beautiful cities, Chandigarh has much more to flaunt than the Rock garden. In the by lanes and sector of the city lay bridal shops which have beautiful designs to win every bride-to-be’s heart! I have jotted down 7 of my favourite designer lehenga stores from Chandigarh. Have your pick! Started way back in 1982, Poshak is one of Chandigarh’s oldest and most sought after lehenga stores. This megastore has an entire floor dedicated to bridal wear! They’ve everything- from chich modern style to the old age traditional. If you wish to visit only one store to buy everything, Poshak is your stop! Poshak in Chandigarh: Shopping Sector 17. Price range for the bridal wear: From 50,000 and above. Started by a young NIFT graduate, Flaunt Couture is a contemporary bridal wear store in Chandigarh. Raw silk, velvet, gotta patti are some of their most popular works. Her work is heavily inspired by Bollywood. Price range for the bridal wear: 4o,ooo onwards. Frontier Raas promises to deliver remarkable quality along with bedazzling motifs and intricate designs. They have a massive collection of lehengas, sarees (personal favourite), cocktail gown and much more. Frontier Raas has multiple stores across Delhi and Chandigarh. Frontier Raas in Chandigarh: Multiple places. Price range for the bridal wear: 50,000 onwards..
Patyala Royal Couture describes itself as a house of luxurious, royal ethnic wear, trousseau and accessories. They believe in setting elusive wardrobe statement straight from a Queen’s almirah. 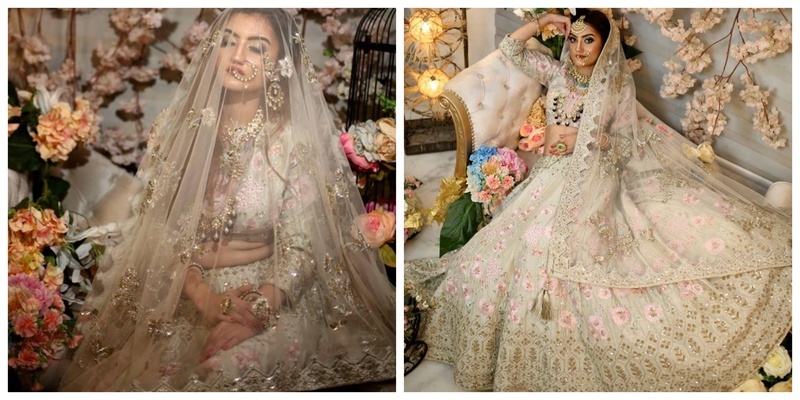 Patyala in Chandigarh: SCO 139-140, Sector 9-C.
Price range for the bridal range: Unknown..
Rachit Khanna, a former stylist turned fashion designer has started his own label in Chandigarh called ‘Turquoise’. He specializes in making exclusive tailored pieces for men and women both. Turquoise in Chandigarh: Near Peddlers, Sector 35-C.
Sidhu Ji is a contemporary bridal store in Chandigarh by Anupreet Sidhu. Describing themself as a ‘storm on rainbow mountain’, Sidhu Ji has collections both for the brides and her bridesmaid. Pretty pastel or glittery sparkles, they’ll make every bride’s dream come true. Sidhu Ji in Chandigarh: Sector 33. Price range for the bridal wear: 40,000 onwards..
From stunning lehengas, glamorous sarees to gorgeous gowns and most desirable suits, Landmark Designer Studio has it all. It won’t leave you disappointed! Pheew! Have we ended your search for the best bridal shop in Chandigarh? Then what are you waiting for? Go get shopping!